In Curacao, one can’t live by sand, surf and the sun alone. You’ve got to eat sometime right? So, don’t just eat anywhere when you are visiting Curacao. 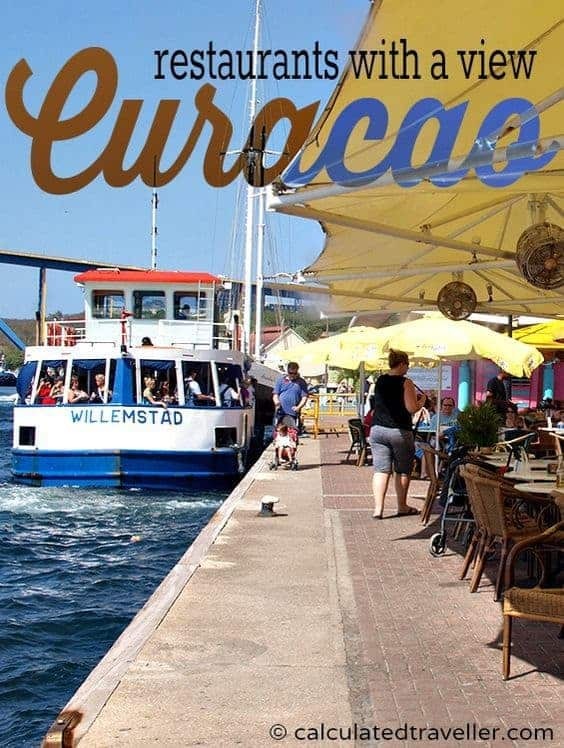 When in the city of Willemstad, why not try a Curacao restaurant with a view? This is the third part of a series of articles on what to do and see in Curacao. Part one: Curacao – The Meaning of Dushi. Part two: Curacao Beaches – Sun, Surf and Sand. Part four: An Itinerary for Touring Curacao in One Day. There are so many choices to choose from when it comes to food in Curacao. Of course, you have your typical food you will find most developed countries like fast food or pizza, but the true magic of dining in Curacao is enjoying and fully appreciating the local cuisine. The local cuisine features blends of Dutch and Indonesian with other cultures mixed together to create the flavorful combination you will find at a lot of the local restaurants. The Dutch influence is strong here and you will find dishes with seafood and cheeses. Some popular dishes in Curacao are – Funchi (a dish made from cornmeal pudding and rice), Pika Hasa (which features red snapper) and Keshi Yena, a Dutch national dish which is a Gouda cheese stuffed with fish (or meat). A local favorite is iguana stew, but many tourist forgo that dish to try some of the other rich bounties of the sea. When in Curacao, you may want to try one of their tasty beverages and none is more famous than Curacao Liqueur, a spirit made from the peels of the bitter Lahara orange. The history of this orange is interesting and dating back from when the Spaniards came to the island. They brought over the sweet Valencia orange, but due to the climate difference, it made the oranges bitter and gave the Lahara orange the taste it has today. Now millions enjoy this unique liqueur all over the world. Be sure to grab some while you are visiting the island or try one of the many mixed drinks at local restaurants that use it. Located in Punda right on the waterfront of Emma Bay and directly next to the Queen Emma Bridge are multiple outdoor patio restaurants for your enjoyment. You can sit here, and people-watch with cooling fans to ease the heat and with daily beer specials – you can’t go wrong! It’s relaxed and comfortable and a great spot to pass the time. One thing, to be aware of is that there are crowds, and it isn’t very private or intimate with all the tourists and ferry passengers milling about, but this is the norm when dining at any outdoor patio. Fort Nassau Restaurant is located at the top of Sablica Hill and has the most amazing 360º panoramic views of Willemstad in the south and the Schottegat (meaning bay or inlet) in the north. Housed within an 18th-century fortress, not only does this restaurant have a view but it also has lots of history. First erected in the early 1800s it went through various name changes AND occupants throughout the years before becoming a restaurant. Originally known as Fort Republiek, it was renamed Fort George (1907-1916) during the British occupation, then renamed Fort Oranje-Nassau when the Dutch retook it. In WWII US serviceman stayed here until 1947. It remained vacant for a time and since 1959 it has been a restaurant. Incidentally, not only is the current resident a restaurant but the Fort also has another resident – the harbour master – who monitors from the tower atop the hill and signals the many vessels that enter the waters surrounding Curacao. Fort Nassau Restaurant offers fine dining with an extensive wine list and an international menu with Caribbean flavour thrown in for good measure. The menu prices are a bit high for this Calculated Traveller’s daily travel budget, but they are affordable given the location, view and atmosphere. There are also 3-course set meals available. With an ambience like this, proper dress is required. Open for weekday lunches and dinner daily. 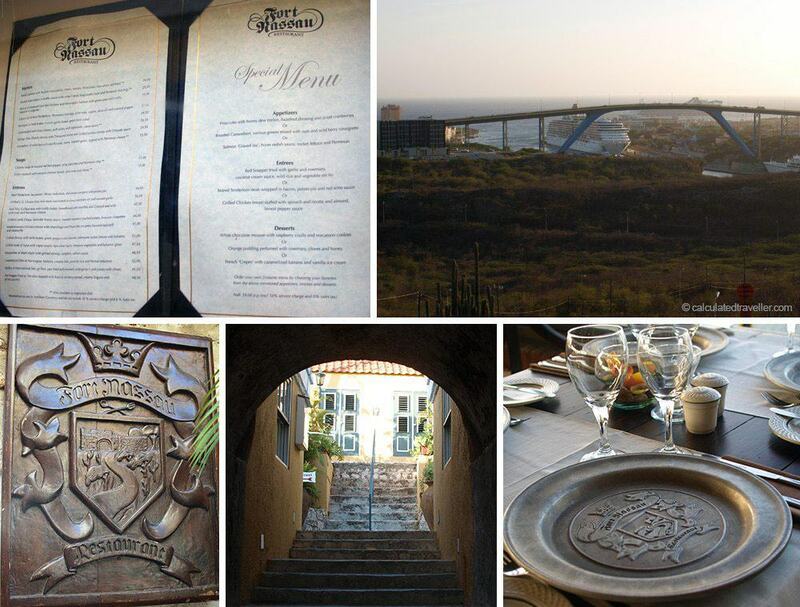 I especially like the little touches that make this restaurant unique like the Fort Nassau crests on the charger plates at each place setting. Located in Otrobanda Kura Hulunda (meaning Dutch Courtyard) is many things. It’s a restaurant and bar, but it’s also a dialysis centre, hotel, spa, sculpture garden, and museum. The UNESCO World Heritage site is a restored 18th-century village of cobblestones and merchant shops. 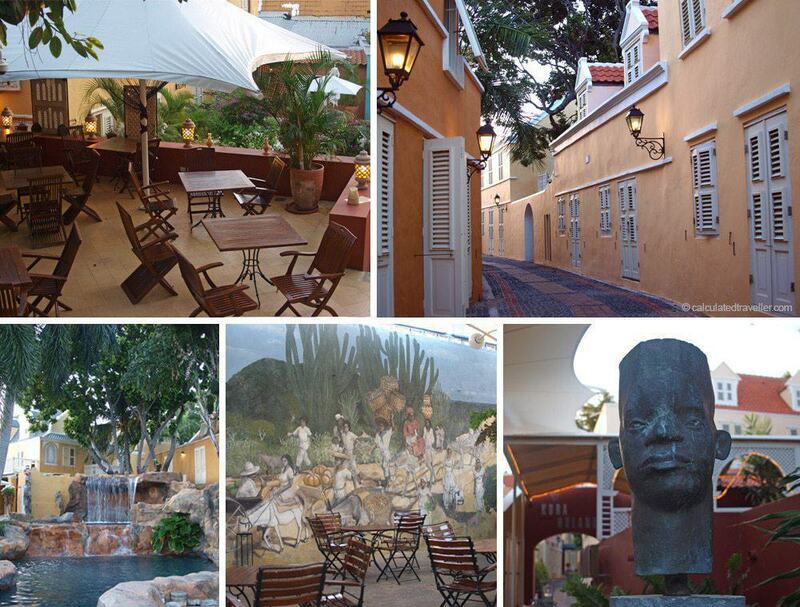 Where the Dutch once traded slaves from Africa, now each shop is a luxury hotel suite. There are sculptures and wall murals throughout the compound as well as greenery and fountains providing quiet corners for reflection. I encourage you to explore the complex and the Museum, which spans more than 16,000 square feet within 15 buildings and has the largest collection of African artefacts in the Caribbean. As you walk through this historic neighbourhood of 65 buildings, you are walking through the actual pathways of slave history. There are multiple restaurants and bars at Kura Hulanda. Suitable for breakfast, lunch or dinner or even for just a coffee or drink. When we visited, they also had live music which added to the atmosphere. Located in Punda behind the Courthouse and just south of Queen Wilhelmina Park is this walled area called the Waterfort Arches. It’s an interesting structure with shops and restaurants tucked within the arches that once were storage chambers for munitions, food, etc. during the war. The day we visited, from the exterior, it was soundless and looked unoccupied. I didn’t know what to make of it as we approached. If this is your experience also, don’t turn back, keep going and walk through the “wall”. Your perseverance will pay off, and before you know it, you will come upon the ocean. The view is fabulous and as you can see I was even able to snap a great shot of our cruise ship from here. There are multiple restaurants along the ocean’s edge for your enjoyment with different types of cuisines and atmospheres. The seating areas are all built on raised platforms that sit above the sea. The cool breeze and the ocean spray from the water hitting the rocks along the shore are really refreshing on a hot day and at night, I can imagine it to be very romantic when dining by candlelight. In Curacao, the views are all incredible, no matter where you find yourself. On the patios you have a waterfront view, at Fort Nassau, you have a panoramic hilltop view, at Kura Hulanda you have a historical view and at the Waterfort Arches, you have an ocean front view. To be truthful I didn’t have a chance to eat at any of these restaurants due to time constraints, so I can’t vouch for their cuisine but as they say “You eat with your eyes first”… all I can say is YUM! I’m always in search for the best local food in Curacao, so if you’ve eaten at any of these restaurants, I’d love to hear what you thought of the food or if you have any suggestions for cheap restaurants in Curacao. Please join the discussion. My tour of Curacao was generously provided by Curacao Tourist Board. My opinions are my own.